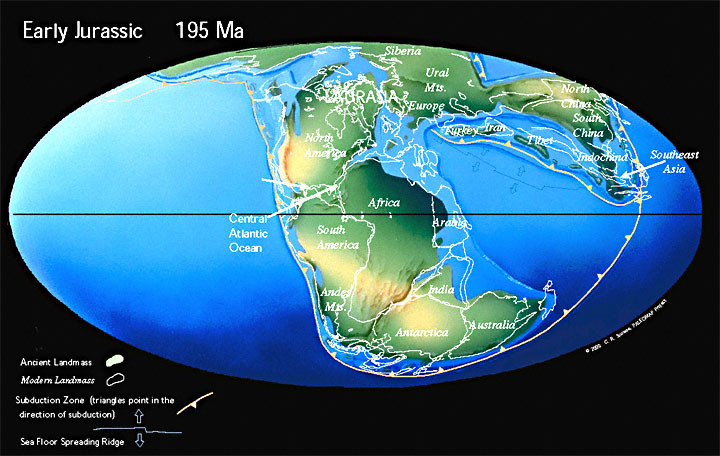 This page describes the Jurassic Period, including stratigraphy, paleogeography, and famous lagerstätten, followed by a sketched outline of some of the major evolutionary events. As yet there is no ratified GSSP for the base of the Berriasian Stage (= the base of the Cretaceous System) although, by common usage, it lies near the first appearance datum (FAD) of the ammonite, Berriasella jacobi. Unfortunately, this ammonite is largely confined to the Mediterranean realm, so the datum is not much use internationally. Paleogeographic reconstruction for the Jurassic from Christopher Scotese’s excellent ‘Paleomap Project’. Throughout the early Mesozoic they remained small, becoming more abundant, larger, and more diverse in the Cretaceous, which may have been a time of explosive radiation of Tribosphenida – early relatives of marsupials and placentals (Rougier 2002). Solnhofen Limestone: Late Jurassic (Lower Titonian); Altmuhl Valley, Bavaria, Germany; fine-grained lagoonal sediments; most famous for the Archeopteryx and Compsognathus fossils found there, though these two together amount to only nine out the many thousands of specimens known from the Solnhofen; Barthel et al. 1990, Viohl 1985. “In an initial period of growth, from Cambrian to Carboniferous time, the oldest sedimentary rocks known in mainland New Zealand were deposited and acreted…. Intrusion of granitic rocks occurred intermittently but mainly during Late Devonian and Early Carboniferous time” (Edbrooke 2017, p. 31). Allison, P.A. 1988: Phosphatised soft bodied squid from the Jurassic Oxford Clay. Lethaia 21: 403-410. Barthel, W.; Morris, S.C.; Swinburne, N.C. 1990: Solnhofen, 2nd ed. Cambridge University Press. Hauff, B.; Hauff, R.B. 1981: Das Holzmadenbuch. Self published: 1-136. Selden, P.; Nudds, J. 2012: Evolution of Fossil Ecosystems (2nd Edition). Academic Press: 1-288. Viohl, G. 1985: Geology of the Solnhofen Lithographic Limestone and the habitat of Archeopteryx. In Hecht, M.K. ; Ostrom, J.H. ; Viohl, G.; Wellnhofer, P. (ed.) 1985: The beginnings of birds. Eichstatt. Freude des Jura-Museums Eichstätt, Willibaldsburg: 31-44.